The Great Barrier Reef is a 2000 km long reef and lagoon complex. It is a UNESCO World Heritage Area covering 347,800 sq. km, sandwiched between the Australia’s north-eastern coastline and the Coral Sea. It includes an estimated 3581 fringing, patch and shelf reefs organized in a matrix filled by an immense lagoon of average depth ~35 m. The total Australia-wide value-added economic contribution generated in the Reef catchment in 2012 was $5.7 billion (Deloitte Access Economics 2013) which includes tourism, recreation, commercial fishing and scientific research and management. It is recognized that activities within catchments that drain in to GBR have adversely impacted the coastal water quality and marine ecosystem health. Although the Great Barrier Reef is recognised as one of the best managed reef systems in the world, coral cover has declined over the last decades at rates similar to less well managed reefs, and research based management and policy is recognised as a pathway for mitigating this trend. Model development to guide management actions is considered a criterion for the effective integration of science and management. Integrated models spanning physical processes through to water quality and ecosystem response are expected to assist regulatory authorities with issues relating to reef management, and to serve as a tool to assist in the evaluation of effectiveness of various management strategies and actions. In this context, the marine modelling component of eReefs was tasked to deliver numerical models capable of simulating and predicting the physical hydrodynamic state, sediment transport, water quality and basal ecology of the Great Barrier Reef lagoon and reef matrix. Together, these models represent a capability to simulate the transport and fate of waterborne material, of either oceanic or terrestrial origin, and its impact on Reef water quality. 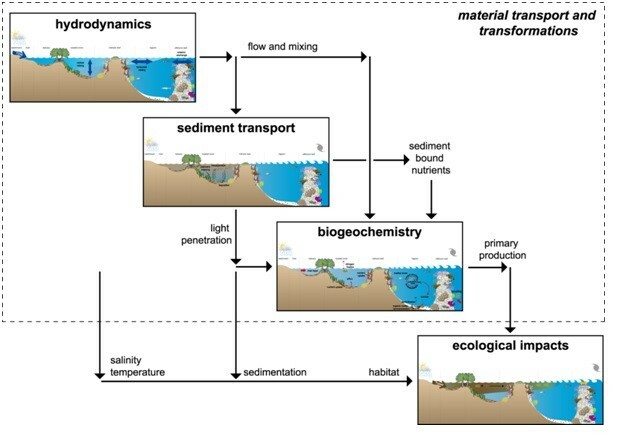 The fate of material delivered to the marine environment can be simulated through the application of materials transport and transformation models (see Figure 1). Hydrodynamic models simulate the advection and mixing of water and as such are a necessary precursor to the development of water quality and ecological response models. Sediment transport models then predict the fate of suspended particulates in the water column and benthos, including transport and mixing processes, settling, resuspension and flocculation. These models require the use of wave models to supply accurate shear stress at the sea bed. Biogeochemical models then build on these to provide a picture of primary and secondary productivity, nutrient cycling and dissolved oxygen dynamics. The eReefs project has developed such a coupled system for the GBR that spans hydrodynamics through to biogeochemistry, and forms the basis of a predictive framework that can be applied generically in the GBR lagoon to support Water Quality Improvement Plan (WQIP) development and implementation (Webster et al., 2008). Figure 1. Primary components of a material transport and transformation models (inside box), and showing internal linkages between sub models and linkage to ecological impacts models (from Webster et al. 2008). The major components of the eReefs marine models are a hydrodynamic model to predict the physical state of the system, a sediment transport model predicting the fate of suspended fine sediments and a biogeochemical model for water column and benthic production, water quality and nutrient cycling. Supporting these components are an optical model with spectral resolution, data assimilation systems, wave models and an offline transport model. Data assimilation is used for parameter estimation during the calibration procedure, to improve the state estimates of the model, and to gain insight into model uncertainty. Wave models provide forcing for the resuspension of particulate matter from the sea floor. The transport model efficiently performs the transport of sediment and biogeochemical variables. A nested suite of regional models is used; a regional 4 km resolution model is nested within a global general circulation model, and a 1 km resolution model is subsequently nested within the 4 km model. Both regional models extend along the Queensland coast from Papua New Guinea to the New South Wales border, and offshore to beyond the continental slope. The 4 km model encompasses some of the Western Coral Sea and the Queensland Plateau, whereas the 1 km model is limited to the shelf regions. The hydrodynamic model relies on Bureau of Meteorology’s numerical weather prediction models (ACCESS-R) to provide surface forcing including wind, atmospheric pressure, surface heat fluxes and rainfall. Freshwater inputs representing the major river systems along the Great Barrier Reef are also included via streamflow observations from the Queensland Government. Open ocean boundary information for the 4 km regional model is supplied from the Bureau of Meteorology’s numerical Ocean Modelling Analysis and Prediction System (OceanMAPS) global ocean model, and the 1 km model receives information from the 4 km model. The eReefs hydrodynamic models provide outputs of sea level, currents, temperature, salinity and mixing characteristics. Outputs are saved offline and subsequently used to transport sediment and biogeochemical variables. The sediment and biogeochemical models operate in both the water column and sediment layers, with exchange of mass across the interface via settling, resuspension and mixing. Ecological processes represented in the models include the phytosynthetic growth of 4 categories of phytoplankton and of seagrass, macroalgae, and coral zooxanthellae, secondary production by zooplankton and corals, gas exchanges of oxygen and carbon dioxide, and transformations of nitrogen, phosphorus and carbon in various forms. Open boundary and river input information for sediments and biogeochemistry is provided using statistical relationships between river flow and loads, and climatology. The models operate in near real-time, such that current conditions may be estimated, and a hindcast archive of historic conditions exists back to September 2010 for the 4 km model and December 2014 for the 1 km model. The near real-time outputs are continuously appended to the archive, so that the hindcast grows over time and is always up-to-date. This hindcast archive is suitable for performing scenario analyses such as exploring the impacts of reductions in nutrient or sediment loads from Queensland catchments. This provides, for the first time, a comprehensive three-dimensional, time varying, view of the current and historical state of the Great Barrier Reef circulation and water quality, though understanding fine sediment dynamics and biogeochemistry. Specific model development was required to capture important and unique processes within the Great Barrier Reef that are not captured by generic models. This included improvements to open boundary conditions and the treatment of river inflows, sub-grid scale reef parameterisations, surface nutrient fluxes, inclusion of biogeochemical functional groups including corals, seagrass and important cyanobacteria (e.g. Trichodesmium), and biogeochemical processes including carbon chemistry and spectrally-resolved optics. The re-locatable model, RECOM, is an automated re-locatable modelling system capable of generating high resolution models of hydrodynamics, waves, sediment transport and biogeochemistry that are nested within the 4 km or 1 km regional models. This package is designed for non-specialist users, whereby the user simply and intuitively interacts with the models via a graphical workflow interface. The models contain numerous parameters, schemes and configurations that have been refined to optimize the model’s capacity to match observations from the Great Barrier Reef. This requires a calibration / validation procedure, where first the model configuration is altered (either heuristically or using data assimilation techniques) so that the output optimally mirrors observations, then this configuration is validated against independent observations (i.e. observations not used in the calibration) to ensure that the model configuration is robust under different conditions. The independent observations may consist of withheld samples, or may cover a different time period. Key to successful calibration is the availability of suitable observations. These observations must span the variables the model is predicting and have adequate spatial and temporal coverage throughout the Great Barrier Reef. The report describes the observational data sets used in the calibration and validation process, which include Reef Rescue monitoring data, data from Australian Institute of Marine Science and CSIRO cruises, data from the Integrated Marine Observing System and satellite observations. Critically, for these observations to be considered adequate, the time and space scales of their sampling must resolve the features that the models are attempting to predict. Inadequate frequency of sampling can lead to serious aliasing of observational records when comparing to model output, and inadequate spatial coverage can lead to small mismatches in position of a feature translating to large quantitative errors. Although a large amount of observations have been collected in the Great Barrier Reef, not all of these are suitable to constrain a model. For example, monthly samples are insufficient to constrain a model whose dynamics are influenced by diurnal, weather band frequency or episodic (e.g. flood, cyclone) events. Surface observations are inadequate to constrain a model where sub-surface dynamics dominate (e.g. sub-surface chlorophyll maximums, sediment transport). Some observations within the Great Barrier Reef are well suited to model calibration (e.g. inshore sea level), whereas some have insufficient spatial and temporal cover (e.g. nutrients). The availability of adequate observation directly impacts the quality of the model calibration able to be achieved, and consequently more certainty can be placed in some components of the models and regional areas than others. Generally, there is a decrease in observation suitability for calibration when moving from hydrodynamics, through sediment transport to biogeochemistry, and consequently the quality of calibration changes accordingly when moving through those components. Comparison of model output to observations is performed qualitatively via visual comparison, and quantitatively using root mean square errors, mean absolute errors, correlation coefficients, bias and statistical based model skill assessment (e.g. Willmott’s skill scores). The configuration that best optimizes model versus observation across all metrics and variables is chosen as the calibration configuration. The quantitative metrics convey the model skill and degree of confidence that may be placed in the model when applying them to their intended use. The calibration / validation procedure reveals that the models do replicate broad scale patterns, are consistent with climatology, capture seasonal dynamics and the occurrence of intra-seasonal events, although the exact timing and location of these events may contain uncertainly. This makes the models suitable for hindcast characterization and scenario analysis (e.g. projections of how Great Barrier Reef water quality will respond to altered environmental drivers). In combination with data assimilation (where sufficient real-time data are available), the models could also be used for short term forecasts. RECOM is functional and can be demonstrated in a CSIRO development computing environment. After consultation with stakeholders, a deployment strategy will be implemented after which RECOM will be publically accessible. Currently, there have been 21 eReefs related papers published in peer-reviewed journals, and eReefs material has been presented at 27 international and national conferences, workshops and seminars. Since there remains a wealth of information residing in the eReefs archive yet to be explored, this list will undoubtedly grow. Many of these publications relate to state-of-the-art development that occurred during the eReefs project, and this development is a significant achievement in its own right. These enhancements notably include advances in data assimilation, open boundary conditions, transport models, optical models, carbon chemistry and inclusion of the impacts of Trichodesmium on nutrient budgets. These developments are transportable to other applications. RECOM was associated with significant development, and currently lies at the forefront of automated relocatable modelling systems; to our knowledge it is the only model of its kind capable of simulating hydrodynamics through to biogeochemistry with its advanced level of automation. The eReefs marine models are suitable for, and currently performing in, near real-time operation. The infrastructure that supports the near real-time operation has now been functioning for multiple years and is considered robust. There is a commitment by CSIRO to continue to operate these models on an on-going basis, and provide outputs to the wider community at various levels ranging from snapshots and animations of key variables, value added products based on these key variables, web enabled exploration of the raw data and access to the raw data itself. Many of these model-based products and data access and integration tools are being developed through other eReefs projects. The on-going operation of the modelling suite and provision of data products will require resourcing, and the level of resourcing will be dependent on the uptake and demand for eReefs products. Currently the commitment is to make the eReefs outputs available and rectify any downtime in a reasonable timeframe within business hours (Mon-Fri, 9-5). Reasonable user requests will be facilitated along similar lines. If demand outpaces the ongoing resourcing levels, then there may be a requirement for additional investment in product delivery. The use of integrated models to assess the effectiveness of management strategies and guide actions is expected to assist Reef management and regulatory authorities with many of the current an emergent issues facing the Great Barrier Reef. Reef management challenges for which the eReefs modelling suite has potential application are numerous and include prediction of coral bleaching hotspots, impacts of ocean acidification on coral calcification, catchment impacts on reef health (sedimentation issues, eutrophication), crown of thorns starfish (COTS) infestations, hypoxia, management of dredging, shipping and port related activities, fisheries management, search and rescue, larval connectivity and prediction of impacts of floods or extreme weather events on marine systems. Since the modelling package operates routinely in near real-time, emergent events such as floods, dredge plumes, phytoplankton blooms, cyclones, vessel groundings, bleaching events etc. may be investigated and responded to in a timely manner. Maintaining a current archive of the state of the Great Barrier Reef assures that any investigations of processes and dynamics remain relevant, and account for shifts in the state of the system. The ultimate goal of major management initiatives such as Reef Plan and Reef Rescue is to protect the health of Great Barrier Reef ecosystems and the ecosystem services they support. These initiatives rely on a cause-effect chain linking land use and practices in catchments, to end of catchment flows and loads, to water quality in the Great Barrier Reef lagoon, to reef ecosystem health. These are complex systems, and there is inevitable uncertainty around all of these links. Quantitative links between end of catchment loads and reef performance measures are critical in order to set, e.g. end of catchment load targets, and to assess the relative benefits arising from load reductions in different catchments. The modeling system developed under eReefs provides a capacity to predict impacts of catchment loads on water quality under acute flood event conditions, and chronic post-flood and dry season conditions. The combined water quality model provides a single integrated and consistent platform to predict changes in water quality in space and time in response to land use and load scenarios for any or all Great Barrier Reef catchments. Further, ecological response models can employ output from the water quality model to simulate, for example, coral cover, coral recruitment, habitat community composition, macroalgae and COTS as indicators of reef health. There are a number of ways in which the eReefs modelling suite could be used to support management decisions. A standard use of models is to predict system responses under alternative management scenarios and use this to assist in planning actions. In this form, models link management actions to performance indicators. Models can also be used for diagnostic purposes; e.g., the model could be used to disentangle effects of interannual variability, or other pressures including climate change, from effects of actions in the catchment, and to explore the interactions among them. They can also be used to assess current compliance against set water quality targets. Models of this kind serve as an infrastructure platform for research as well as management. They provide an environment for evaluating new hypotheses about processes and system interactions and for designing field experiments and optimizing observing programs. There is a commitment to continue the provision of eReefs marine modelling outputs to the wider community on an ongoing basis. These products are not an endpoint, but should be considered a tool in a manager’s or researcher’s toolkit that complements existing methodologies employed to gain system understanding (e.g. monitoring). They are also not static, but expected to adapt as new information becomes available to warrant enhancements. They will not solve all the Reef’s problems, but if used appropriately will contribute to better solutions of reef management and fill gaps in system understanding. In a sense the difficult tasks are yet to come, whereby all information available, including eReefs products, are used in conjunction with expert’s understanding of the Great Barrier Reef to deliver practical strategies that can improve reef health into the future.